Warning- this is not “literature.” While I would love this to be a more literate children’s book, it is not. It is pure slapstick, middle-school humor. Yet it is an utterly silly but useful children’s book, especially for any young reader (or adult, for that matter), who continues to struggle with low self-esteem. 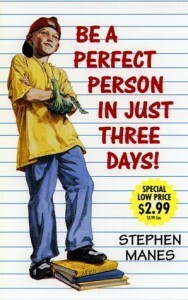 With a great deal of ridicule, and yet with serious intention, the book ends the idea of perfection. With that, perhaps we can settle into our own imperfect and flawed humanity, and be content. I must admit I picked up this children’s book while I myself was running a litany of critiques in my mind… “I’m not this, I’m not that.” A very quick read through this short but funny children’s book was the perfect medicine. Why are we still thinking that perfection is something to aim for? This children’s book is definitely aimed at middle school readers, because it is utterly silly. Who would even think about wearing a broccoli to school? So the writing stretches us past believability. Yet in doing so, it does let us consider how desperate one might be in the search for acceptance and perfection.